This was part of my 2012 reading list. I used this book as my daily devotional throughout the year. (I also used it to swipe some quotes for our family calendar.) I gave this book 4 out of 5 stars, though now that I’ve used it for a year, I’d like to bump that up to 5 out of 5 stars. Daily readings for busy moms. That is what the title could have been. I’m not Catholic, but I did enjoy this book. There are a few days and prayers that are more Catholic specific, but I did not find them off putting, they were simply different for me. 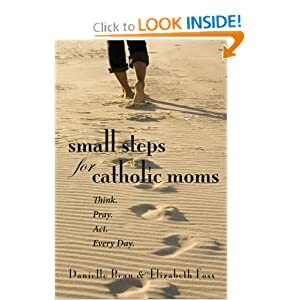 If Roman Catholicism makes you uncomfortable, you should probably avoid this book (and rethink your position). Each day, you read a short Bible verse or quote from a Saint. There is a short prayer to read and then a small task to do that day to fix your mind on the reading and prayer. Each month is a particular theme, so you aren’t jumping from one thing to the next each day. For a month, you cultivate and practice the same thing. It isn’t enough to really be considered a devotional for all the time, but it is a great way for a busy mom to start the day in the right frame of mind. I originally gave it 4 stars because I wish that each day had both a quote and a scripture reading for that day. I would say that you will likely want something else devotional, but for those days when life gets crazy and you can’t even get a shower, this small devotional book is exactly right to get you on the right track. I very strongly recommend this book. And I’ll be using it for another year. I enjoyed it that much.